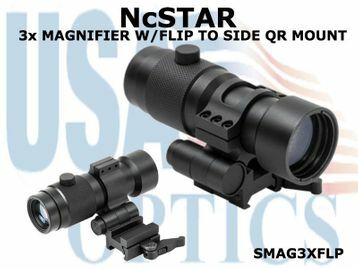 The NcSTAR 3x Magnifier w/Flip to Side Versatile Quick Release Mount tilts to the right side when desired and locks into position. These Red Dot Sight Magnifiers from NcSTAR are made of durable black anodized aluminum and are compatible with most rails. This magnifier is at the perfect AR15 height for co-witnessing with your iron sights. When it is mounted behind a 1x reflex optic, you can easily switch magnification levels depending on your distance to the target. » Length - 4.6 in.